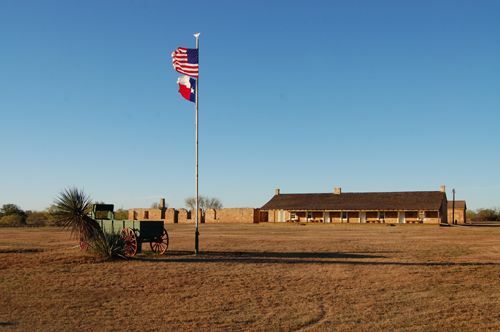 There are dozens of forts, military installations, and old camps across the Lone Star State. With the arrival of the first Spanish conquistadors in the region now known as Texas in 1519, it was already populated by numerous Native American tribes, whose ancestors had been there for thousands of years. Soon regions of Texas would be claimed by both royal France and imperial Spain, both of which would mount military expeditions to explore various areas. A small number of simple fortifications were established in this era to protect both French and Spanish claims from each other, and to protect expeditionary operations from unwelcoming local inhabitants. For over two centuries, various groups fought over access and/or control over the region that would become Texas. During the period from 1519 to 1848, all or parts of Texas were claimed by six countries: France, Spain, Mexico, the Republic of Texas, the United States of America, and the Confederate States of America in 1861–65. Ownership of specific lands were also claimed and disputed by different ethnic groups, including numerous Native American tribes, Mexican residents, Anglo- and African-American settlers, and European immigrants. Access to and control of resources were also claimed and disputed by various economic groups, such as farmers, ranchers, settlers, buffalo hunters, traders, bandits, and revolutionaries. Over the centuries, claims and disputes were enforced by Native American warriors, Spanish conquistadors, French cavaliers, Texas Rangers, local militias, and uniformed regular army regiments of Spain, Mexico, Texas, the United States, and the Confederacy. During these years of dispute, there were numerous military camps, barracks, fortified trading posts, palisades, stockades, blockhouses, strongholds, and fortifications built to establish, defend, or dispute the many claims to the area. Many of these are long gone, but the Lone Star State continues to preserve a number of historical buildings, some are still operational military installations, and sites are designated by historical markers.